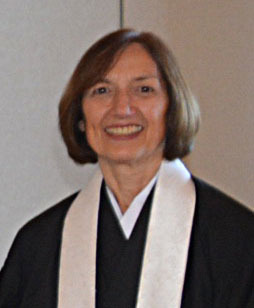 Sensei Michele Keido Daniels, dharma heir to Sensei Ray Ruzan Cicetti in the White Plum lineage received dharma transmission in March 2018 and is Sensei Cicetti’s first dharma successor. Michele Sensei is a resident lay teacher along with Sensei Cicetti at The Empty Bowl Zendo. She was the zendo’s practice leader for four years before becoming a Dharma Holder. She received Jukai in 2012 and served as Shuso for two Angos. Currently she serves on the EBZ Board and organizes residential retreats. She is a former public school educator who supervised the district’s English as a Second Language and Bilingual Education Program. Currently Sensei Daniels enjoys retirement with her husband.